Marlowe: And if it destroyed the superego? Lanyon: Then it would have no conscience, no guilt, no shame. He would give way to every blind impulse, every repressed desire, every secret wish. He would be the most dangerous human being on earth. A monster. When one thinks of horror films in England, one immediately thinks of the Hammer studios. But during the 1970s Hammer had a feisty competitor in Amicus Productions, which tended to specialize in anthology films such as Asylum. 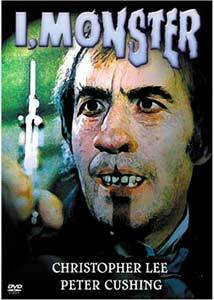 Like many Hammer horrors, I, Monster features both Peter Cushing and Christopher Lee in a period genre setting. This was one of the more substantial efforts by Amicus, though it was hampered by being partially shot in a pseudo-3-D process that didn't work very well. Dr. Charles Marlowe (Christopher Lee) is a Freudian psychologist interested in the duality of man, arguing with attorney Utterson (Cushing) and friends Enfield (Mike Raven) and Lanyon (Richard Hurdnall). Testing his theories by injecting one of his female patients with a drug, he succeeds in releasing her sexual repressions. Testing the drug on himself, Marlowe assumes the identity of Edward Blake, who becomes increasingly violent as his addiction to the drug grows greater and greater. As can be seen from the character names other than those of Lee and the story, this is a thinly-disguised version of The Strange Case of Dr. Jekyll and Mr. Hyde. Why Amicus felt it necessary to change the references to Jekyll and Hyde in a work plainly in public domain is unclear; perhaps they sought to distance it from Hammer's Dr. Jekyll and Sister Hyde, released the same year. In any event, it's a fairly faithful retelling of the novella, though the movie is clearer in its development of the sexual repression themes than Stevenson was ever able to do. Lee and Cushing as usual do a fine job, though Lee's part is obviously much meatier than his frequent partner's. The supporting cast is reasonably good as well, though the film itself leaves a fair amount to be desired. Marlowe is presented as being of dubious ethics to begin with, not only injecting his patients with the personality-altering drug, but accepting a female patient's sexual offers under the influence. So it's hardly surprising that once his superego is shut down completely Marlowe has the potentiality of a complete monster. Intriguingly, the portrayal of Blake/Hyde is a mixture of the Fredric March and Spencer Tracy versions. He initially is barely different physically, with Lee assuming a slight overbite and a dark shift in character. As the evils progress, Blake/Hyde gets more and more hideous until he is truly monstrous. It's an interesting take on the story, and the romance angle created in earlier film versions is completely chucked, keeping the focus properly on Stevenson's story. Where the film falls a bit short is with novice director Stephen Weeks. Some scenes are badly lacking in pacing and seem to last several beats too long, making the viewer impatient. Camera use is unimaginative and fairly static for the most part. This was a serious problem for the 3-D effect, which depended on camera movement for it to work. Some remnants of the attempt are still seen in the effective tour of Marlowe's lab with a long pan, but I didn't perceive any 3-D aspect to it. The picture is a bit talky, but has a few good moments, especially as it draws to a climax. The running time is a full five minutes longer than listed on the IMDB, giving credence to Retromedia's statement that they have cut together several different print to make the longest possible version. Image Transfer Review: Retromedia all too often releases widescreen films transferred from pan-and-scan television prints, so the fact that this is in 1.78:1 is welcome (though I suspect 1.66:1 would be more accurate since it was a British release). The unfortunate part is that the transfer is nonanamorphic and appears to be derived from a videotape master with all the attendant softness and lack of definition. Color is reasonably good though reds are a bit oversaturated. Despite an apology from Retromedia regarding the print quality, moderate speckling is the only serious defect on the print(s). Audio Transfer Review: The 2.0 mono English track is passable though it suffers from a fair amount of hiss and noise. But for a cheap horror film from 1971 it's decent enough. Just don't expect to be impressed. Extras Review: Retromedia isn't renowned for extras on most of its discs, and there are a few more here than usual. A badly faded trailer is in somewhat rough shape. Almost a dozen black-and-white shots are included in a still gallery slideshow. Finally, the keepcase includes a four-page reproduction of a British pressbook for the film (or at least parts of one). Such ballyhoo tools are always fascinating so this is a nice extra to have. The chaptering is a dismal six stops. An okay version of Jekyll & Hyde, propelled mainly by the star power, but the only good thing that can be said about the transfer is that it's not pan and scan.